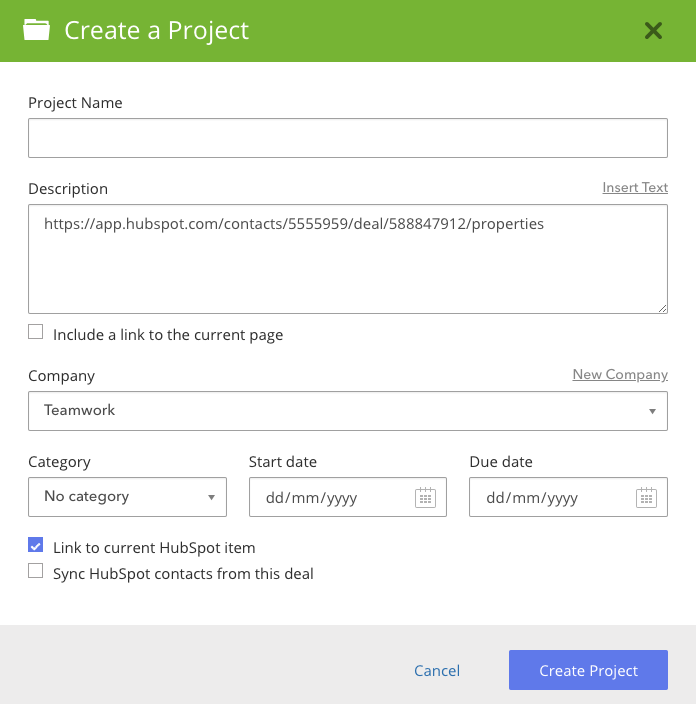 Within Teamwork Projects, you can create project items directly from deals within your HubSpot account. To enable and use the integration, you will firstly need to have tags enabled from your site settings. You will also need to ensure you have integrated with the Teamwork Projects Chrome extension. You can then connect to your HubSpot account in the Integrations section of your site settings in Teamwork Projects. 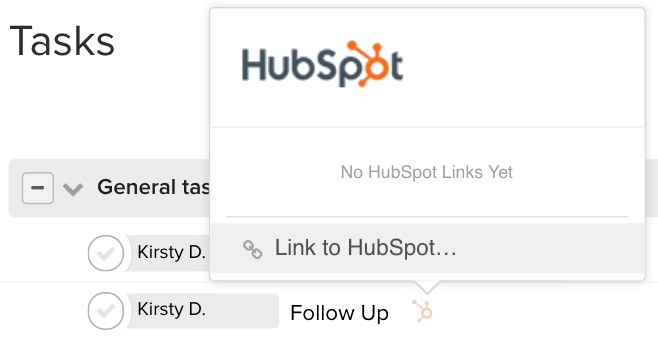 Selecting the HubSpot icon will allow you to link the item to HubSpot. For example, you can choose to link a deal, blog post or other. Once you have linked an item, it will be listed in the modal when you hover over the HubSpot icon. Within HubSpot, the linked item will have a Teamwork Projects icon associated with it. By clicking the icon, you will have the option to create a project from this deal or to be redirected to the task in Teamwork Projects. 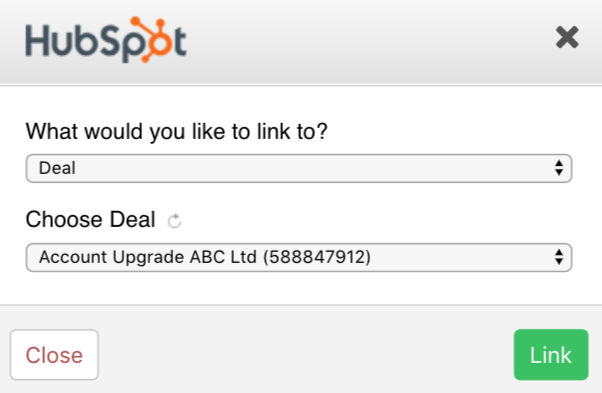 When creating a project from a deal in HubSpot, you will see the relevant link to the HubSpot deal in your task description. There will also be the option to link to the current page, and to sync contacts. To create other project items, select the Teamwork Projects icon in the navigation bar. From here, you will have the option to create different project items such as tasks, milestones, and events. Using any of these options will automatically create the item within your Projects site. 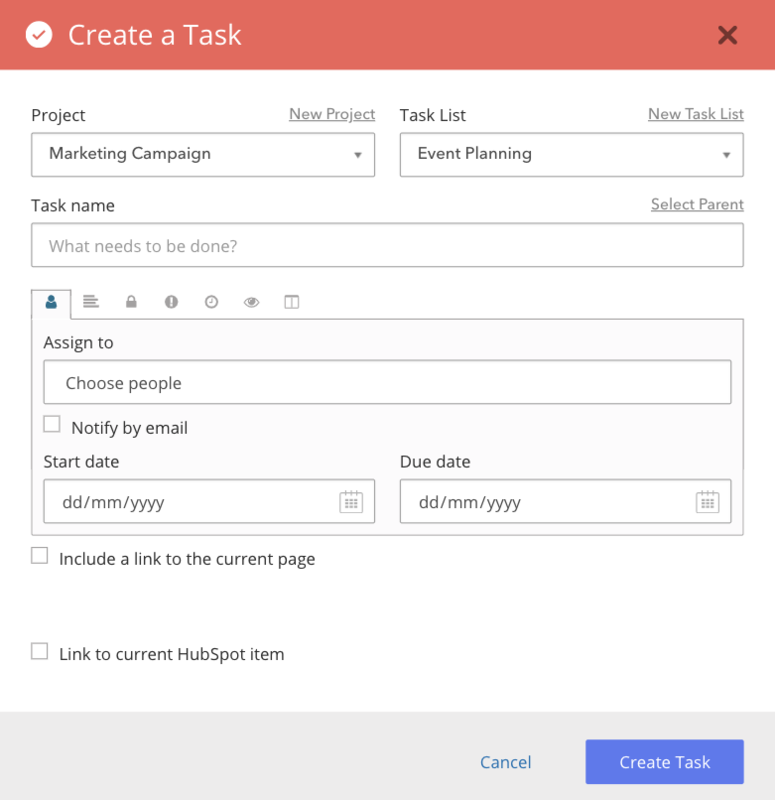 For example, when creating a task, you will have the option to link to a current HubSpot item or include a link to their current page you are creating from item from. Note: Items can only be created from HubSpot to Projects, not from Projects to HubSpot.